Can I change the message format OR can I define my own message? 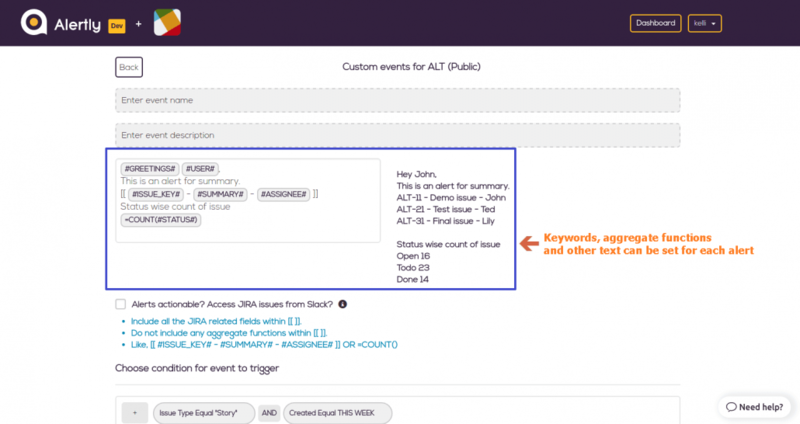 Alertly provides feature to add custom template for every alert created. User can add emojis, jira fields as well as aggregate functions within the template along with normal text. https://alertly.io/wp-content/uploads/2017/11/alertly-purple-beta-logo.png 0 0 Alertly https://alertly.io/wp-content/uploads/2017/11/alertly-purple-beta-logo.png Alertly2017-10-17 05:13:102017-10-17 05:13:10Can I change the message format OR can I define my own message? Is it possible to took action on JIRA issues/tasks from Slack messages? I don’t know how to create events, are there any samples available?